A Detailed Guide on Classification of Soil. 1. Particle Size Classification of Soil. 2. Textural Classification of Soil. 3. 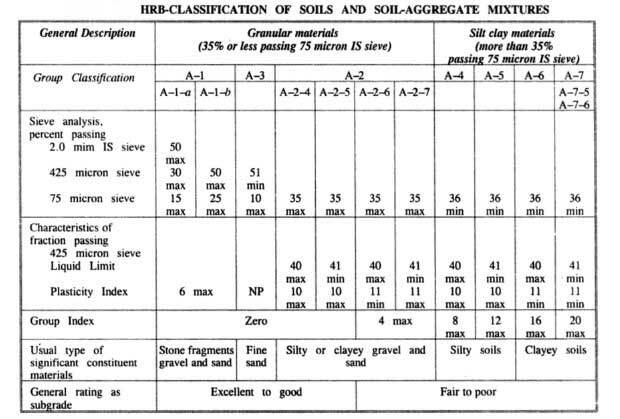 Highway Research Board (HRB) Classification of Soil. 4. Unified Soil Classification System (USCS). 5. Indian Standard Soil Classification System, ISCS (IS: 1498-1970). 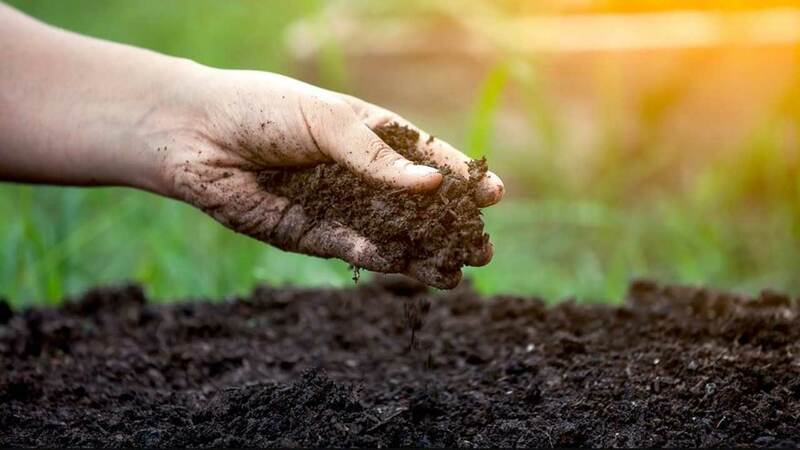 The purpose of the classification of soil is to arrange various types of soils into groups according to their engineering or agricultural properties and various other characteristics. Soil possessing similar characteristics can be placed in the same group. Soil survey and soil classification are carried out by several agencies for different purposes. For example, the agriculture departments undertake soil investigations from the point of view of the suitability, or otherwise, of the soil for crops and its fertility. However, from the engineering point of view, the classification may be done with the objective of finding the suitability of the soil for construction of dams, highways or foundations, etc. 4. 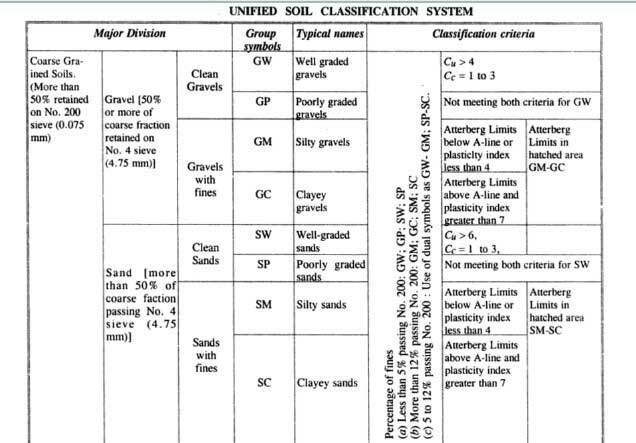 Unified soil classification and IS classification system. You’ll know all of the above, different classifications of soil in details here. Read More: Field Density Test of Soil by Sand Replacement Method. In this system, soils are arranged according to the grain size. Terms such as gravel, sand, silt, and clay are used to indicate grain sizes. These terms are used only as a designation of particles size and do not signify the naturally occurring soil types, which arc mixtures of particles of different sizes and exhibit definite characteristics. It is preferable to use the word ‘silt size’ and ‘clay size’ in place of simply ‘silt’ or ‘clay’ in this system. There are various grain size classifications in use, but the more commonly used systems are following. 1. U.S. Bureau of Soil and Public Road Administration (PRA) System of the United States. 2. International soil classification, proposed at the International Soil Congress at Washington. D.C. in 1927. 3. The M.I.T. 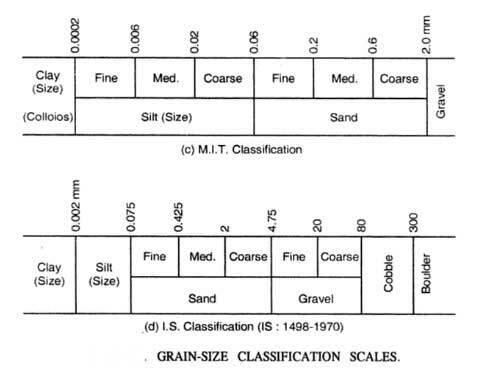 classification proposed by Prof. Gilboy of Massachusetts Institute of Technology as a simplification of the Bureau of Soils Classification, and the Indian Standard Classification (IS: 1948-1970) based on the M.I.T. system. These four systems are shown in the below picture. Soils occurring in nature are composed of a different percentage of sand, silt, and clay size particles. distribution is known as textural classification. 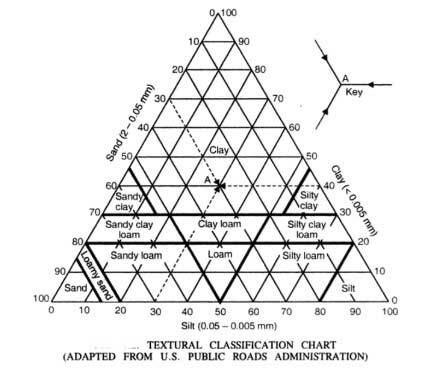 Probably the best known of these textural classifications is the triangular classification of U.S. Public Roads Administration, shown in the below picture. This classification is based on the percentages of sand, silt and clay Sizes making up the soil. Such a classification is more suitable for describing coarse-grained soils rather than clay soils whose properties are less dependent on the particle size distribution. To use the chart, for the given percentages of the three constituents forming a soil, lines are drawn parallel to the three sides of the equilateral triangle, as shown by arrows in the ‘key’ of above picture. For example, if the soil is composed of 30 percent sand, 30 percent silt sizes, and 40 percent clay sizes, the three lines so drawn intersect at the point A situated in the sector designated as ‘clay’. Such a soil will be termed as ‘clay’. The Highway Research Board (HRB) classification system, also known as Public Road Administration (PRA) classification system, is based on both the particle-size composition as well as the plasticity characteristics. The system is mostly used for pavement construction. Soils are divided into 7 primary groups, designated as A – I, A – 2,…, A – 7 as shown in the below picture. Group A – 1 is divided into two subgroups and group A – 2 into four sub-groups. A characteristic group index is used to describe the performance of the soils when used for pavement construction. Group index is not used to place soil in particular group: it is actually a means of rating the value of soil as a sub-grade material within its own group. The higher the value of the index, the poorer is the quality of the material. The group index of a soil depends upon (i) the amount of material passing the 75-microns IS sieve, (ii) the liquid limit, and the Plastic limit, and is given by the following equation. Group index = 0.2 a + 0.005 ac + 0.01 bd. a = that portion of percentage passing 75-micron sieve greater than 35 and not exceeding 75 expressed as a whole number (0 to 40). b = that portion of percentage passing 75-micron sieve greater than 15 and not exceeding 55 expressed as a whole number (0 to 40). c = that portion of the numerical liquid limit greater than 40 and not exceeding 60 expressed as positive whole number (0 to 20). d = that portion of the numerical plasticity index greater than 10 and not exceeding 30 expressed as positive whole number (0 to 20). Classification procedure; With required test data available proceed from left to right on the chart (in the above picture), and the correct group will be found by the process of elimination. The first group from the left into which the test data will fit is the correct classification. The plasticity index of A – 7 – 5 sub-group is equal to or less than liquid limit minus 30. Plasticity index of A – 7 – 6 sub-group is greater than the liquid limit minus 30. The group index should be rounded off to the nearest whole number and placed in parentheses, such as A-2-2(6) or A-6(6). Classification of Indian Black Cotton Soils; The divisions of A – 7 group on the basis of the demarcation line ( Ip = WL – 30) into A – 7 – 5 and A – 7 – 6 sub-groups does not appear to divide the Indian Black Cotton soils into two distinct groups having maximum value of group index as 20 only. 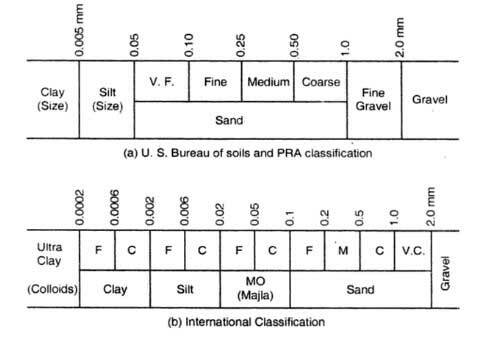 Originally developed by Casagrande (1940), the Unified Soil Classification System (USCS) was used for air field construction during World War II. It was later (1952) modified slightly by the Bureau of Reclamation and Corps of Engineers of USA, to make it applicable to other constructions like foundations, earth dams, earth canals, earth slopes, etc. The system has also been adopted by American Society of Testing Materials (ASTM) and later by Bureau of Indian Standards (1970). According to the USCS, the coarse-grained soils are classified on the basis of their grain size distribution while the fine-grained soils, whose behavior is controlled by plasticity, are classified on the basis of their plasticity. The below picture gives the group symbols consisting of a prefix and a suffix. Thus, there are in all IS groups of soils — 8 groups of coarse-grained soils, 6 groups of fine-grained soils (including organic soils), and 1 group for peat. The soils are first classified into two categories: (i) coarse-grained soils, and (ii) fine-grained soils. (i) Coarse-grained soils. If more than 50% of the soil is retained on No. 200 US sieve (0.075 mm), it is designated as coarse-grained soil. A coarse-grained soil is designated as gravel (G) if 50% or more of the coarse fraction (plus 0.075 mm) is retained on No. 1 (4.75 mm) US sieve; otherwise, it is termed as sand (S). Coarse-grained soils, containing less than 5% fines, are designated by symbols GW and SW if they are well graded and by symbol GP and SP if they are poorly graded. If however, the percentage of fines is more than 12%, the coarse-grained soils are designated by symbols GM, GC, SM or SC, as per criterion laid down in the below picture. Similarly, if the percentage of fines lie between 5 to 12%, coarse-grained soils are designated by dual symbols GW-GM or SP-SM. (ii) Fine-grained soils. A soil is termed as fine-grained if more than 50% of the soil sample passes No. 200 US sieve. The fine-grained soil is subdivided into silt (M) and clay (C), based on their liquid limit (WL) and plasticity index (Ip). 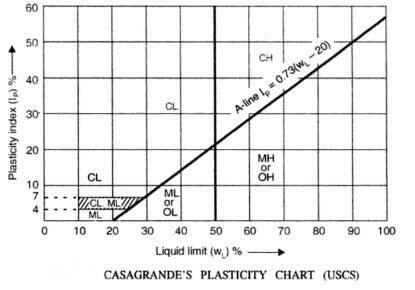 Organic soil (O) is also included in this group, the below picture shows the plasticity chart devised by Casagrande (1948), and used for the USCS system. The A – line in the chart has the equation Ip = 0.73 (WL – 20). This A – line generally separates the more clay-like materials from those that are silty, and also the organic soils from inorganic soils. The fine-grained soils (i.e., silt, clay and organic fraction) are further subdivided into soil possessing low (L) or high (H) plasticity when the liquid limit is less than 50% or more than 50% respectively. When the plasticity index and liquid limit plot in the hatched portion of the plasticity chart, the soil is given dual symbol CL – ML. Soils possessing the characteristics of more than one group are termed as boundary soils and are designated by dual group symbols. For example, symbols GW – GC means that the soil is well-graded gravel with some clay fines. 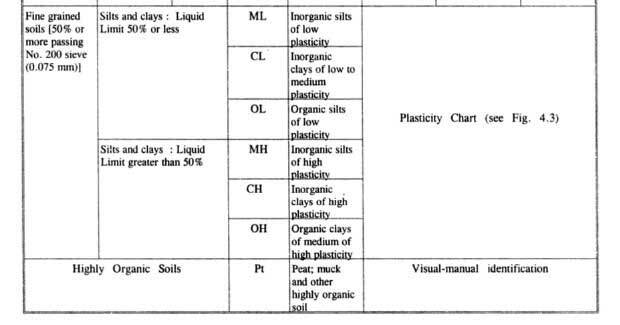 Also, the inorganic soils (ML or MH) and organic soils (OL or OH) plot on the same zone of the plasticity chart. Oven drying method is used to distinguish between organic and inorganic soils. If the liquid limit of the soil decreases by 30% or more, it is classified as organic (OL or OH): otherwise it is classified as inorganic (ML or MH). Highly organic soils, fibrous in nature and having high compressibility, usually peat and swelling soils, are not further subdivided but are put into one group only with group symbol Pt. After the soil has been classified according to unified soil classification system (USCS), its important properties and relative desirability for various uses can be identified from the engineering use chart given by Wagner (1957). Read More: Quarrying of Stones: Its Methods, Selection of Site, Preparation Steps. Watch the Video for more clear view on Classification of Soil. The Indian Standard Soil Classification System (ISCS), first developed in 1959, was revised in 1970. This revised version is essentially based on USCS with the modification that the fine-grained soils have been subdivided into three groups (low, medium and high plasticity) as against only two groups (low and high) in the USCS. The ISCS classifies the soils into 18 groups as against 15 groups of USCS. 1. Coarse-grained soil. In these soils, more than half the total material by mass is larger than 75-microns IS sieve size. (a) Gravels (G). In these soils, more than half the coarse fraction ( + 75-microns) is larger than 4.75 mm IS sieve size. This sub-division includes gravels and gravelly soil and is designated by symbol G.
(b) Sands (S). In these soils, more than half the coarse fraction ( + 75-microns) is smaller than 4.75 mm IS sieve size. This sub-division includes sands and sandy soils. M Containing fine materials not covered in other. These symbols used in combination designate the type of coarse-grained soils. For example, CG means clayey gravels. 2. Fine-grained soils. In these soils, more than half the material by mass is smaller than 75-microns IS sieve size. (a) Inorganic silts and very fine sands. (c) Organic silts and clays and organic matter. The fine-grained soils are further divided into the following groups on the basis of the following arbitrarily selected values of liquid limit which is a good index of compressibility. (i) Silts and clays of low compressibility, having a liquid less than 35 and represented by the symbol L.
(ii) Silts and clays of medium compressibility, having a liquid limit greater than 35 and less than 50, and represented by the symbol I. (iii) Silts and clays of high compressibility, having a liquid limit greater than 50 and represented by a symbol H.
3. Highly organic soils and other miscellaneous soil materials. These soil contain large percentages of fibrous organic matter, such as peat, and the particles of decomposed vegetation. In addition, certain soils containing shells, concretions, cinders and other non-soil materials in sufficient quantities are also grouped in this division.